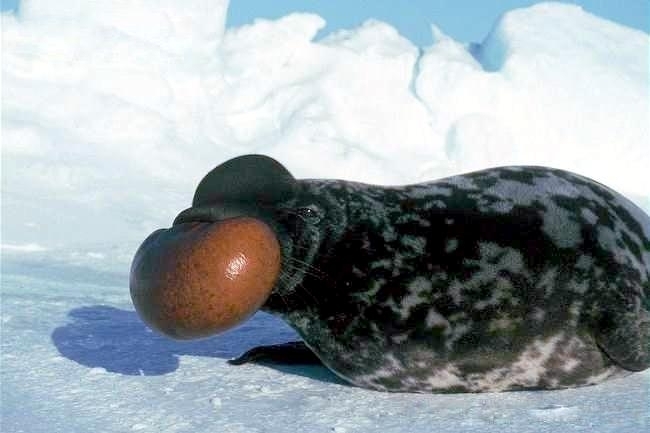 Hooded Seals are named for the large elastic sac that extends from their noses to their foreheads that expands into a large balloon-like ball in the adult males. 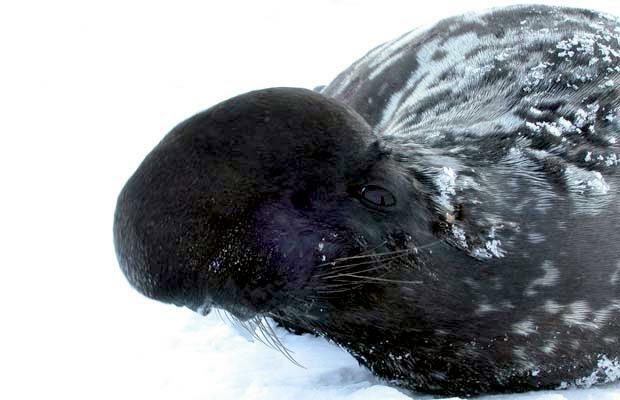 Hooded Seals have a black face and a blue-gray coat with patterns of dark patches. 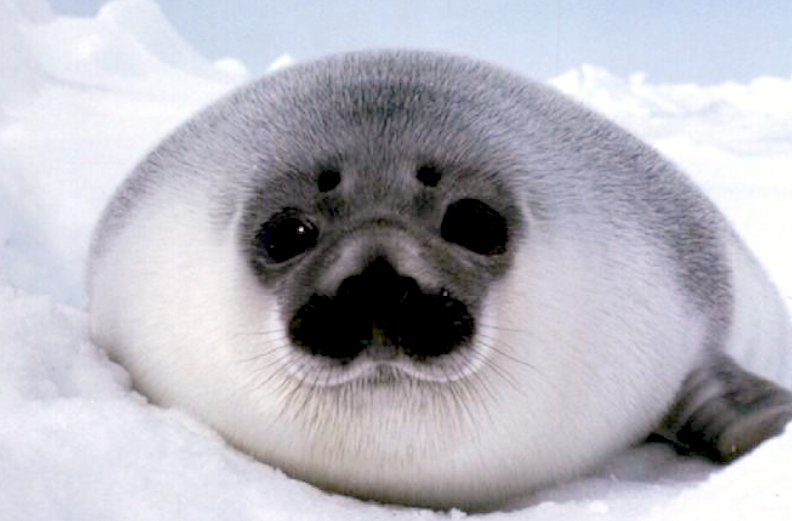 Adult males measure an average of 2.5-3 meters in length and weigh about 300-400 kilograms. 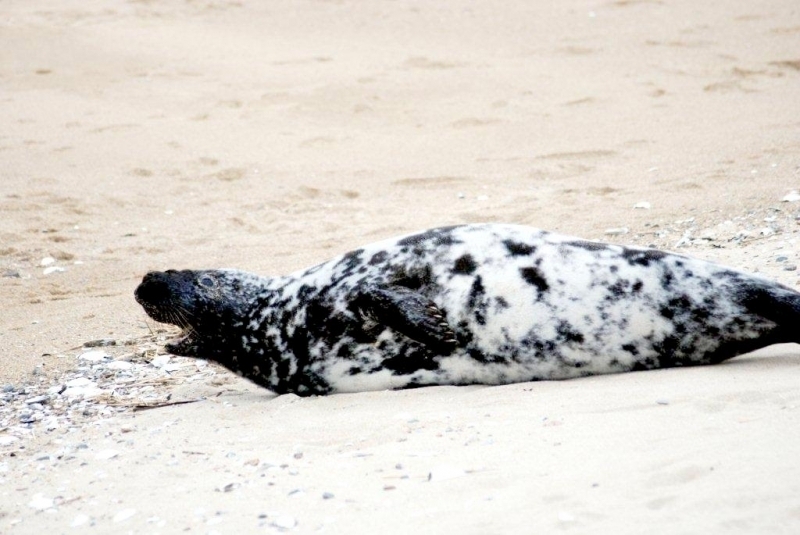 Adult females are smaller, measuring an average of 2-2.4 meters in length and weighing about 160-230 kilograms. 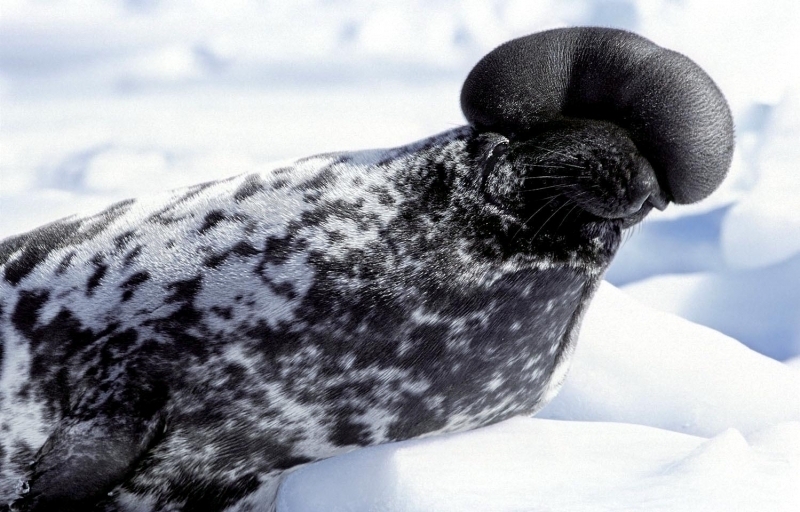 Hooded Seals are known to dive repeatedly to over 1,000 meters for more than 50 minutes. 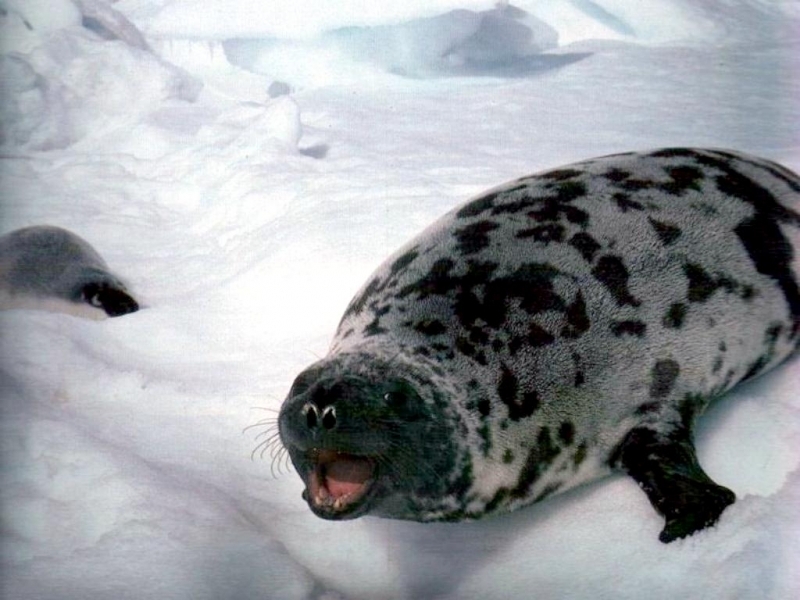 The life span of the Hooded Seal is 31-35 years of age. 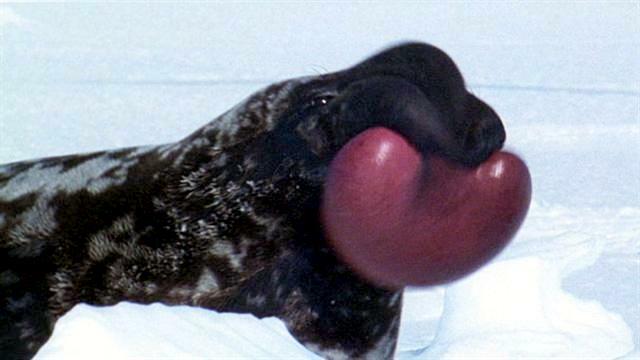 Hooded Seals are very aggressive compared to other seal species. 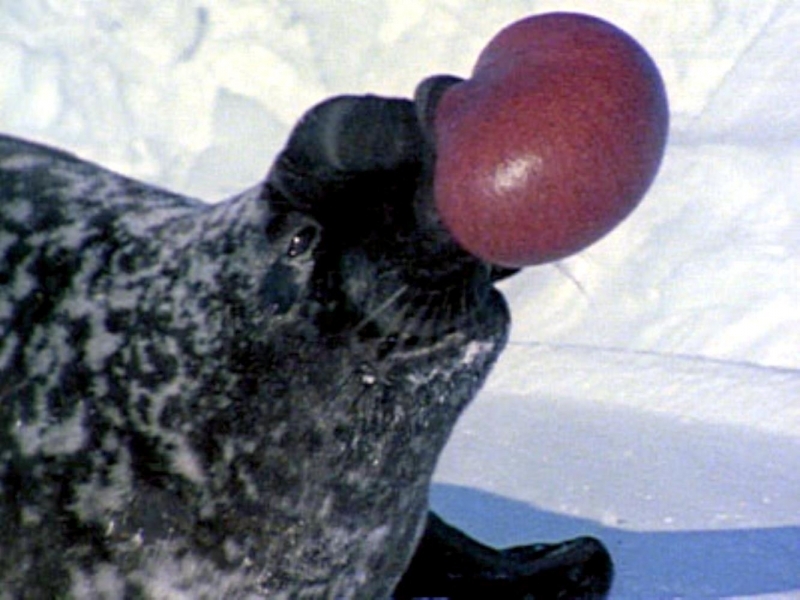 Adult males demonstrate their aggression by inflating their “hood” (balloon-like ball on their face), which can grow to twice the size of a football. 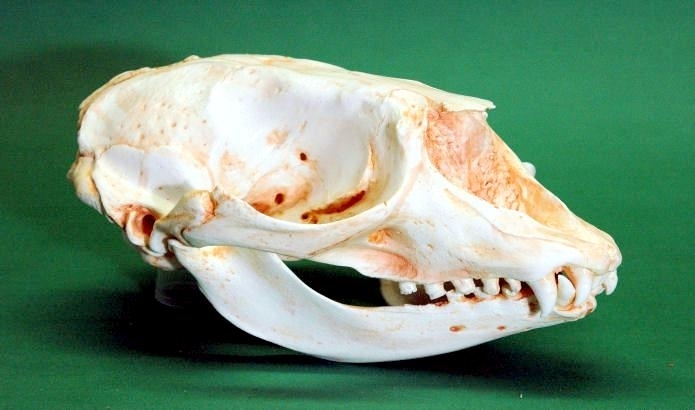 The “hood” is an enlargement of the nasal cavity which develops at about 4 years of age. 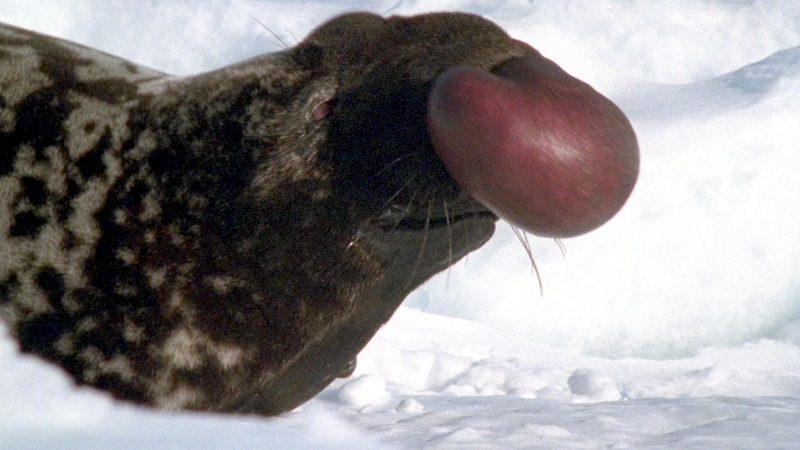 When inflated, the hood forms a balloon on the head, when deflated the hood hangs in front of the upper lip. 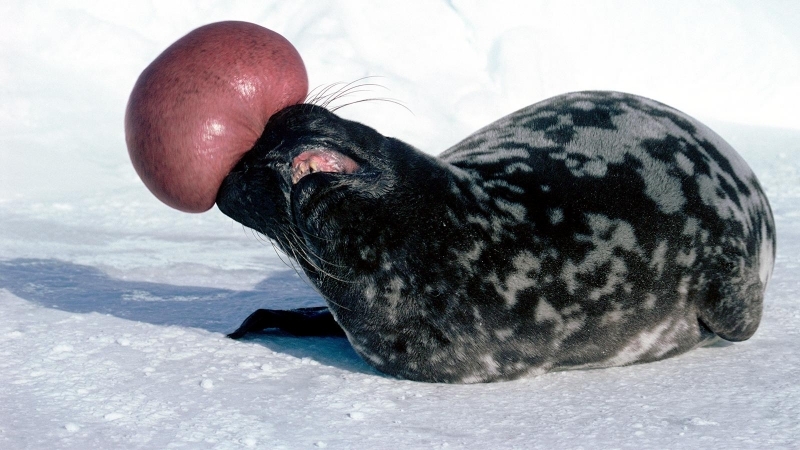 Male Hooded Seals also have an inflatable nasal membrane that expands like a red balloon from one nostril that “pings” when shaken. 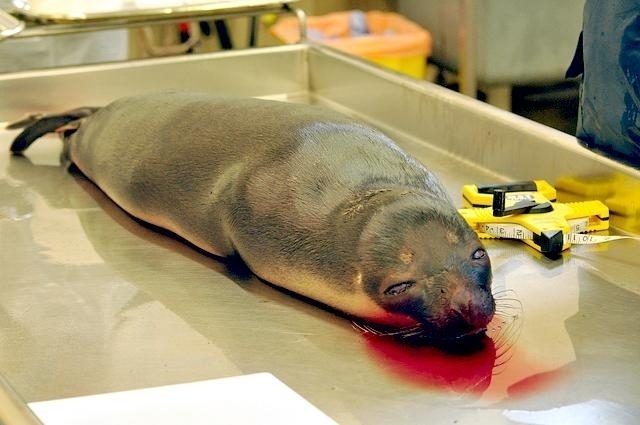 The hood and membrane are used for aggression display when threatened and as a warning during the breeding season. 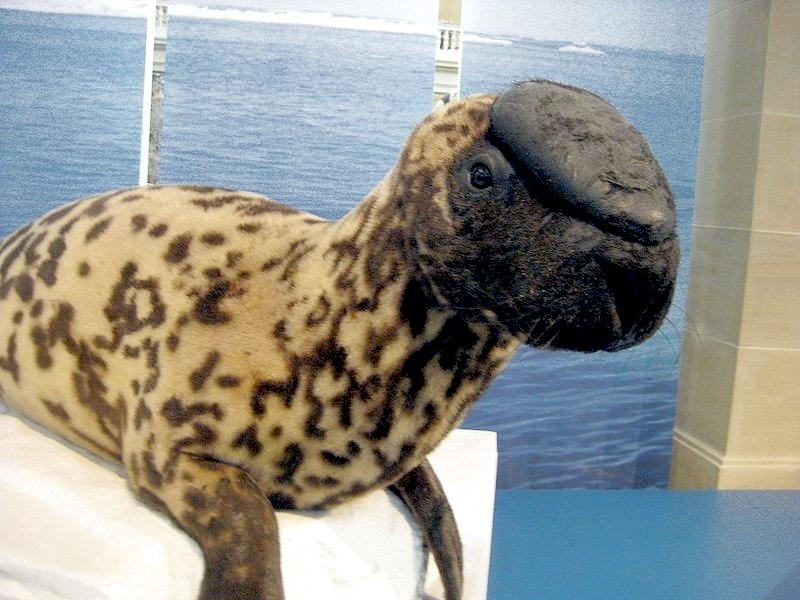 Hooded Seals are found in deep waters in the far north Atlantic Ocean. 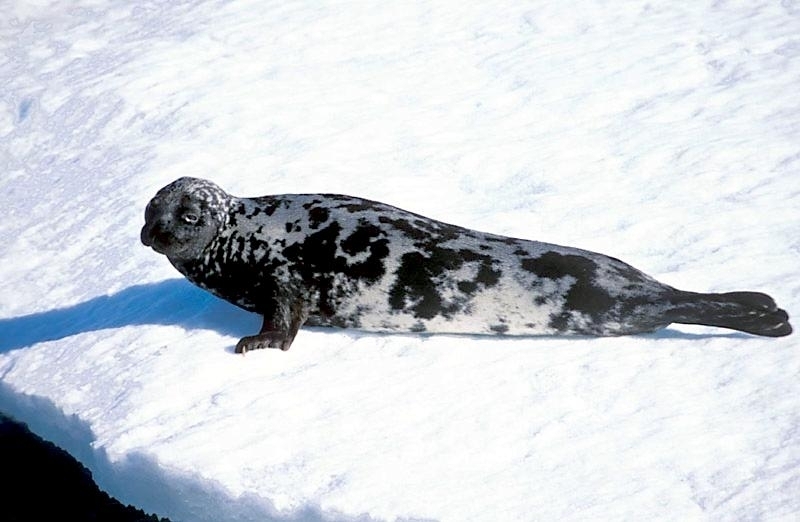 This species ranges from Svalbard in the east to the Gulf of St. Lawrence in the west. 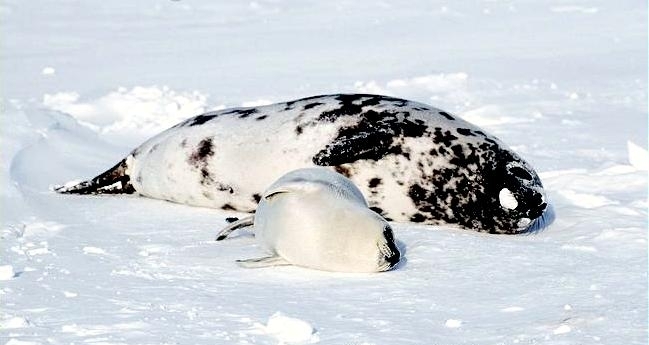 Four distinct populations can be found on the pack ice: near Jan Mayen Island, off Labrador and northeastern Newfoundland, in the Gulf of St. Lawrence and in the Davis Strait. 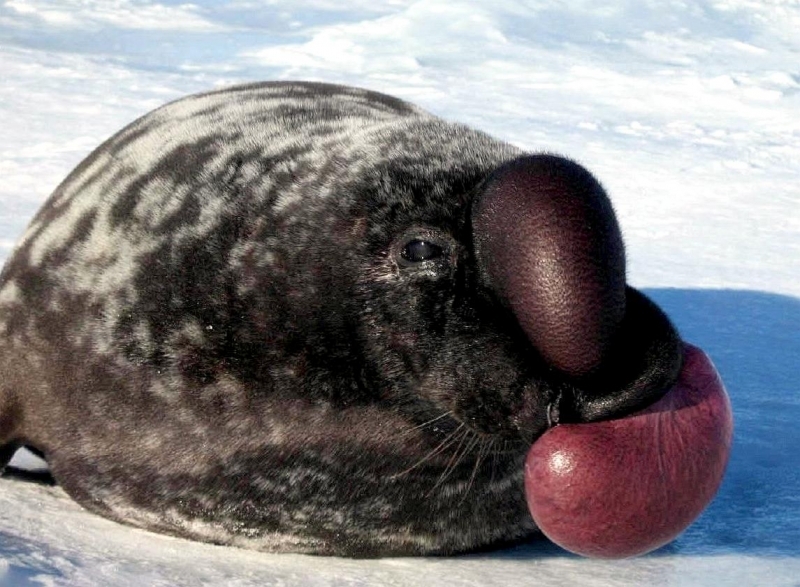 The total Hooded Seal population is currently estimated to be 650,000, consisting of 250,000 in the Jan Mayen population and 400,000 in the northwest Atlantic Ocean. 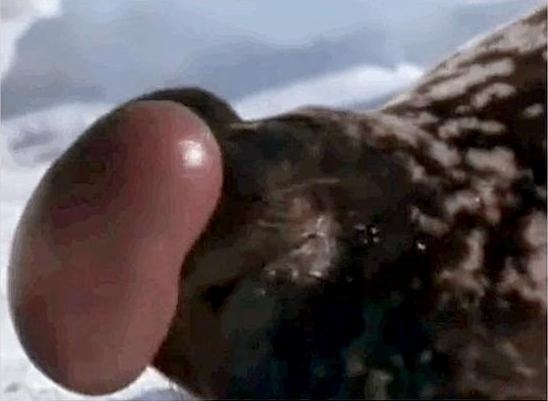 This is a highly migratory species known to wander long distances as far west as Alaska and as far south as the Canary Islands and the Caribbean island of Guadeloupe. 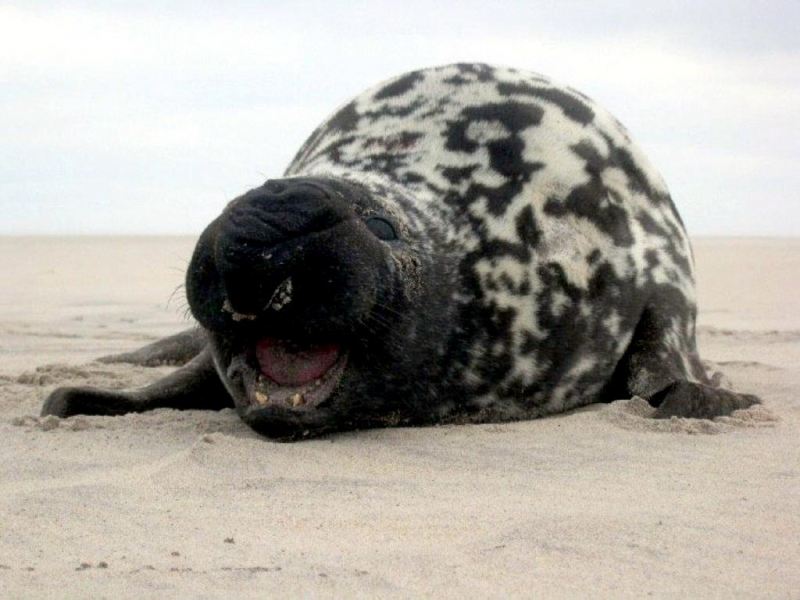 After the breeding season, usually from April-June, these seals travel long distances to feed. 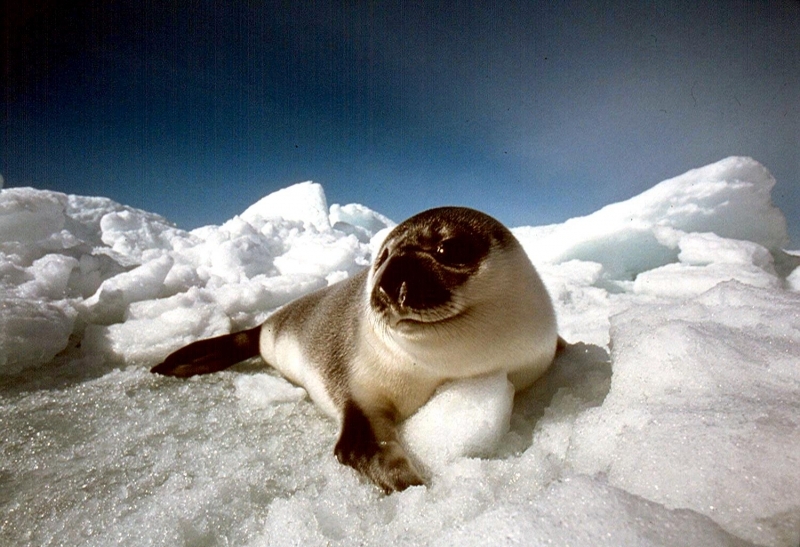 In June-August, they reunite on the ice to molt after which they disperse to feed until breeding season begins in late winter. 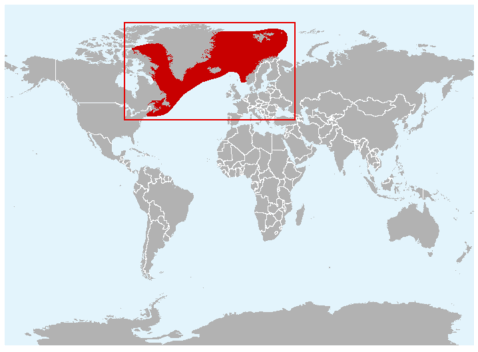 Migratory patterns are not yet well documented, however the northwest Atlantic populations appear to molt off the east coast of Greenland in the Denmark Strait then travel north. 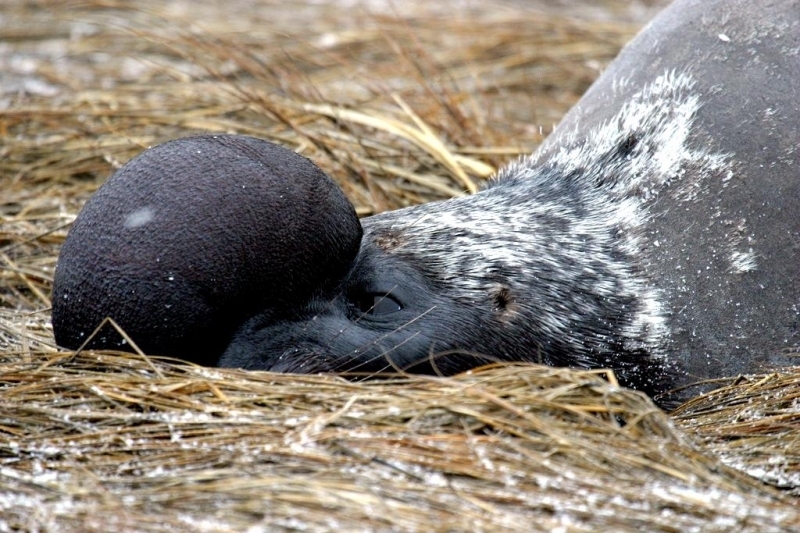 Hooded Seals are also seen along the coast of western Greenland. 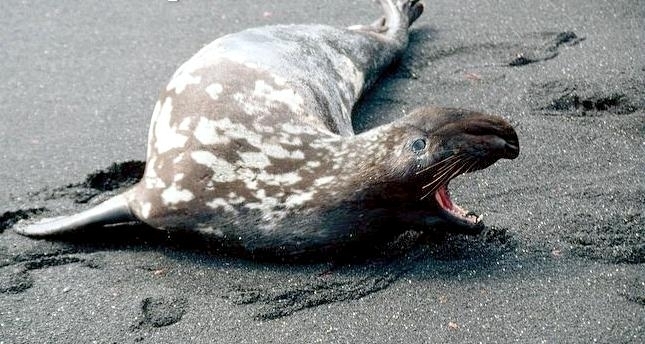 Individuals from the Jan Mayen population appear to molt on two sites north of the breeding area then disperse to feed in Svalbard, Iceland, Norway and the Faroe Islands. 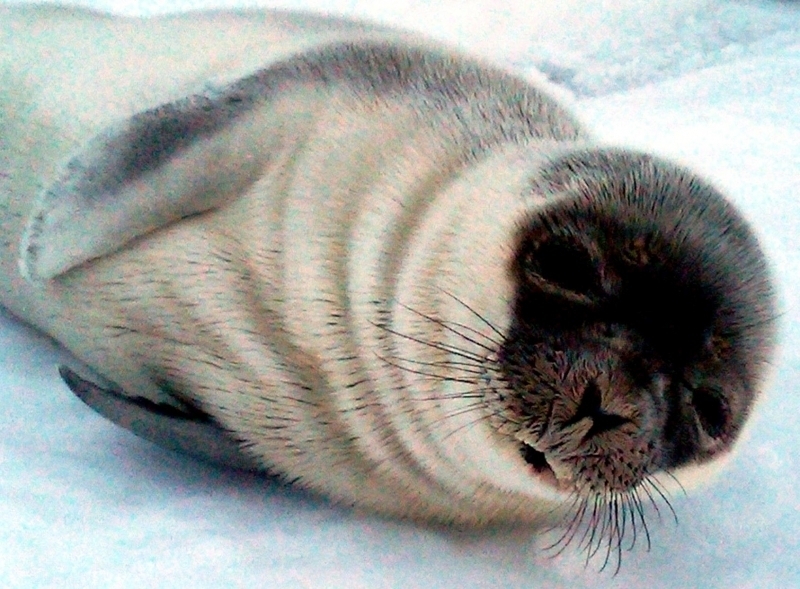 The northwest Atlantic populations are thought to winter in waters off Newfoundland. 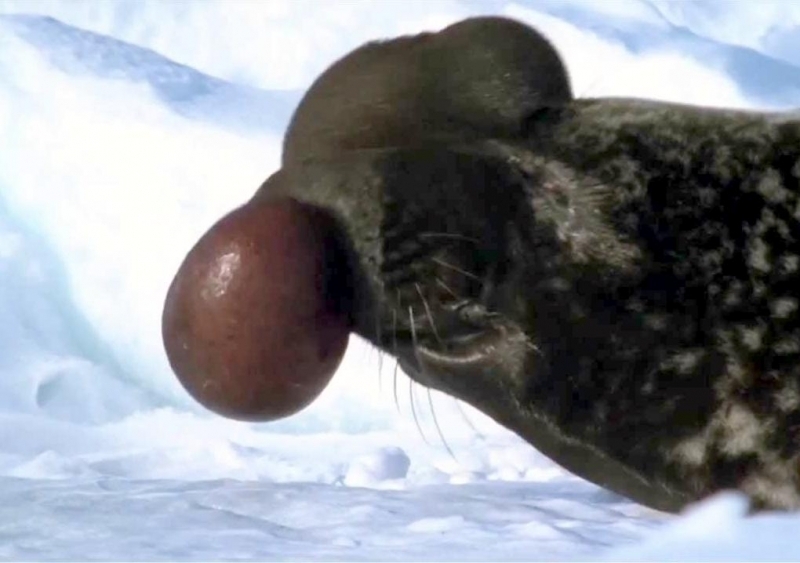 Hooded Seals feed in deep water diving to depths of 100-600 meters. 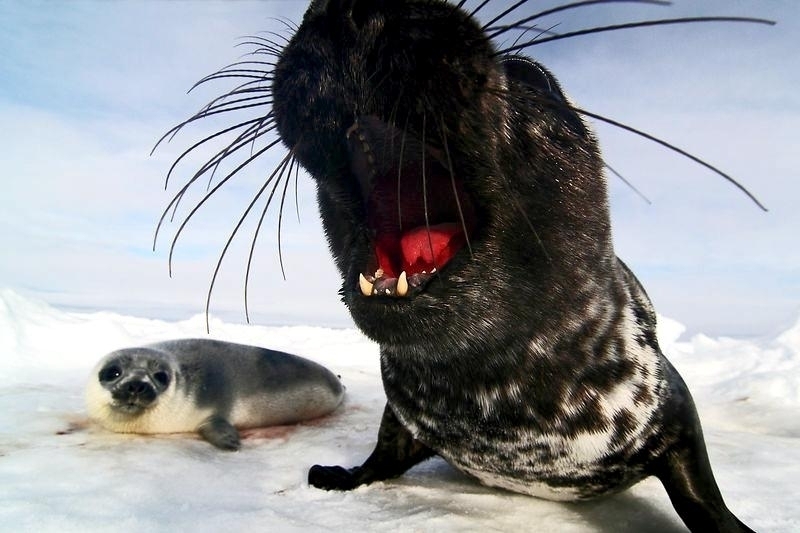 Their diet varies regionally and includes halibut, redfish, cod, wolffish, capelin, herring, octopus, squid, shrimp and mussels. 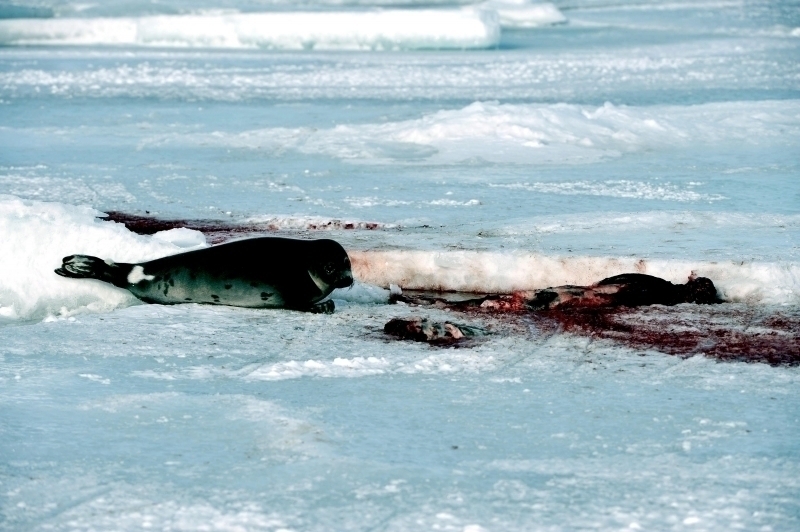 Known predators of Hooded Seals are Polar Bears, Greenland Sharks and Killer Whales. 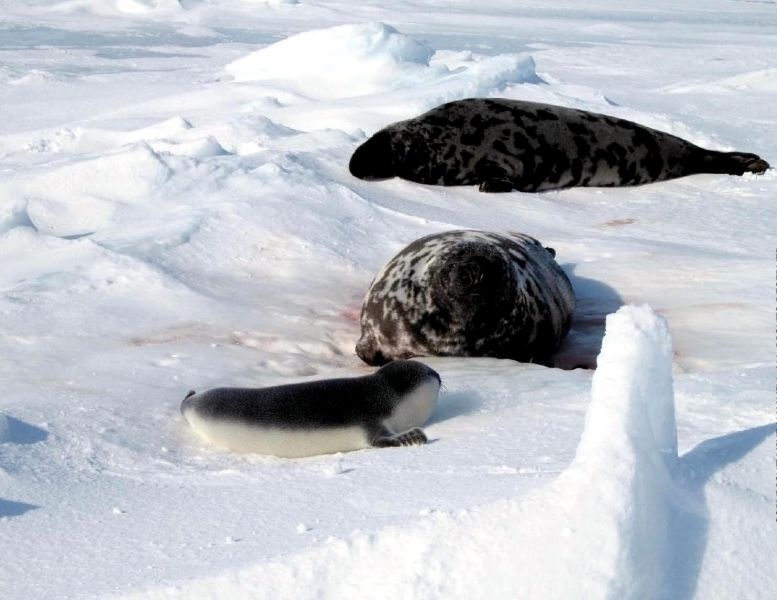 Female Hooded Seals mature between 3-6 years, males at 5-7 years. 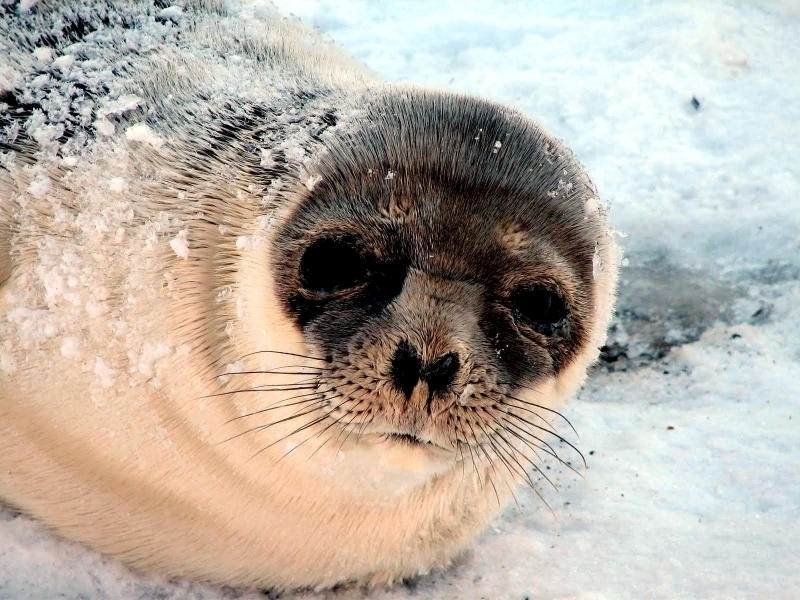 The amount of interchange between the different breeding populations of this highly migratory species is unclear, although a sighting of a Harp Seal-Hooded Seal hybrid pup have been reported. 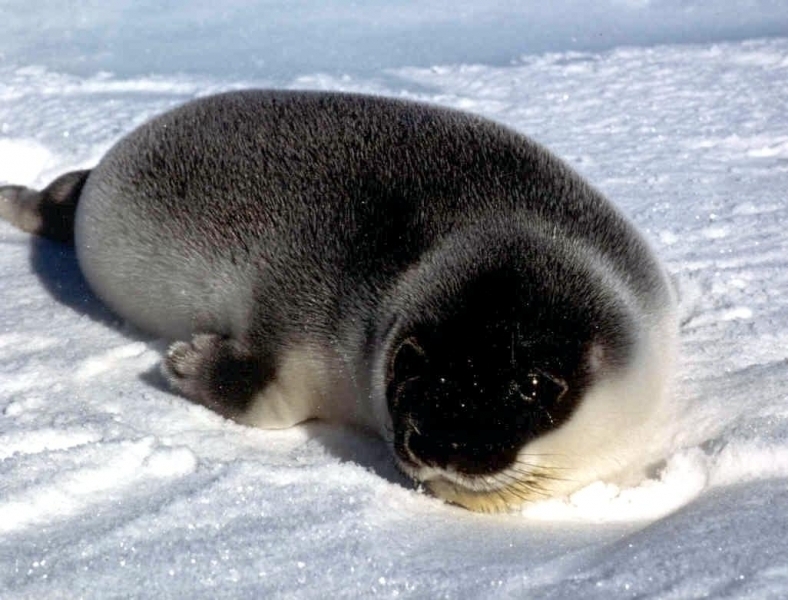 Pups are born between March-April with a well-developed blubber layer and a blue-gray coat, which led to their nickname “blueblack”. They will molt this coat in about 14 months. 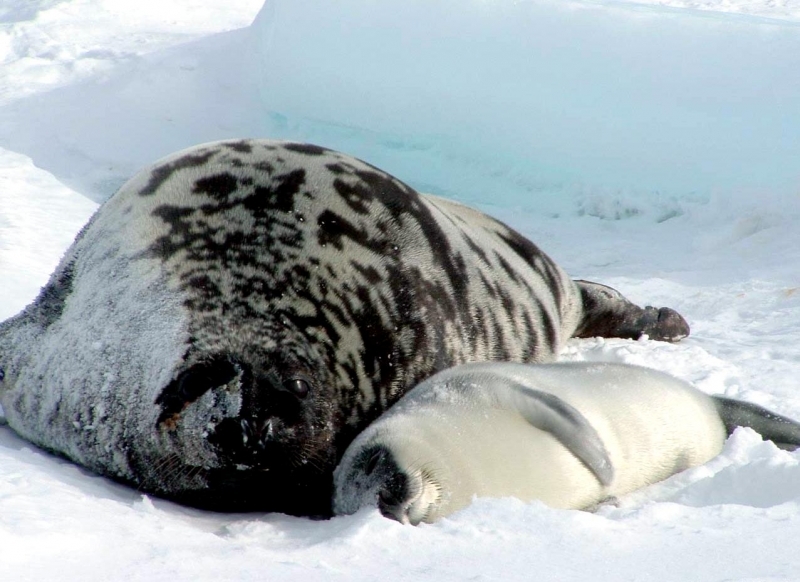 Newborn pups measure about 1 meter and they weigh about 24 kilograms. 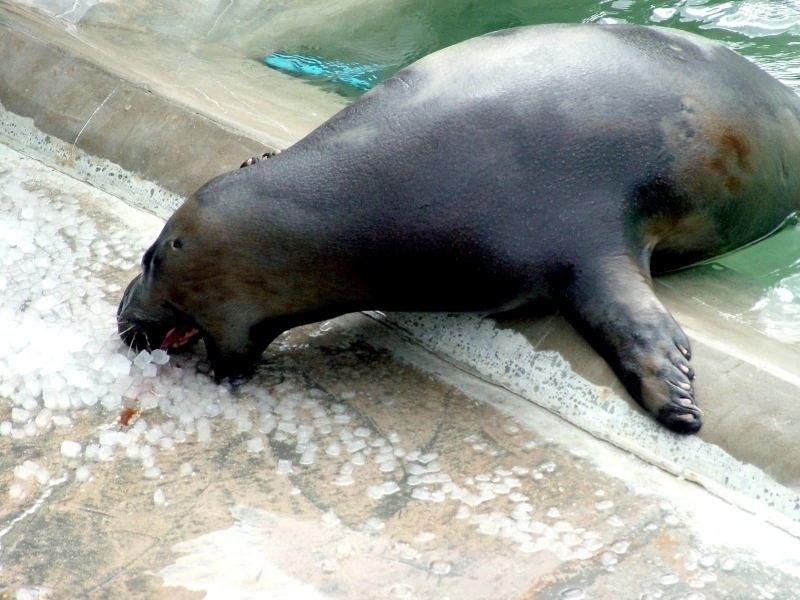 Nursing only lasts an average of 3-8 days, the shortest lactation period of any mammal. 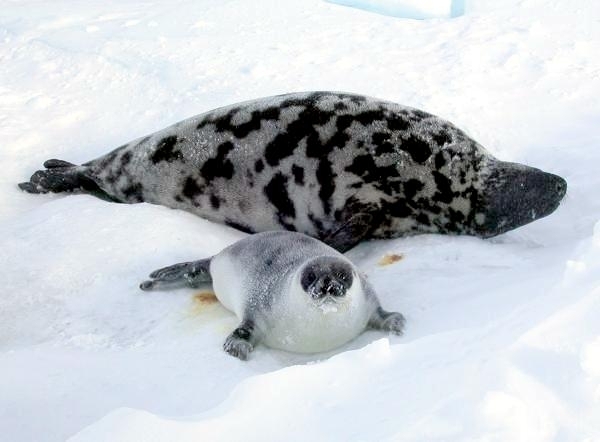 In spite of the short nursing period, the Hooded Seal pup doubles in size from about 24 kilograms to about 47 kilograms thanks to mother’s rich milk made up of between 60-70% fat. 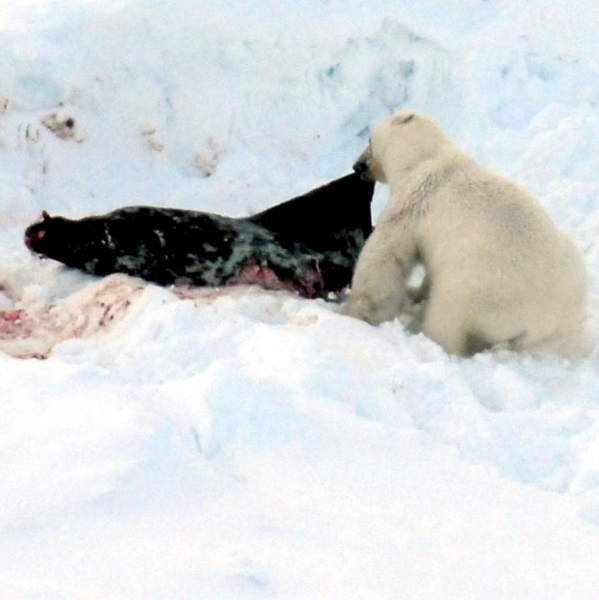 When the females start giving birth, the begin males competing for breeding territory by pushing & fighting each other. 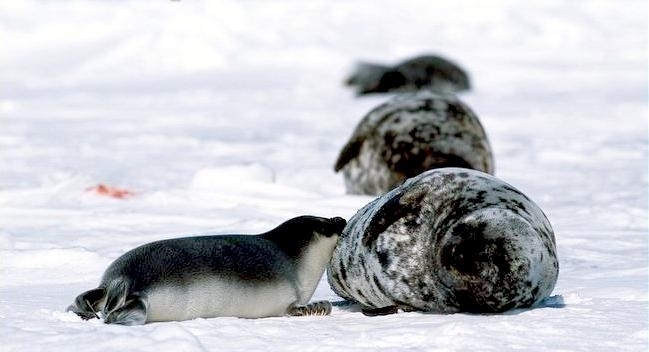 Males then wait to mate while the female nurses forming temporary “families” or “triads”. 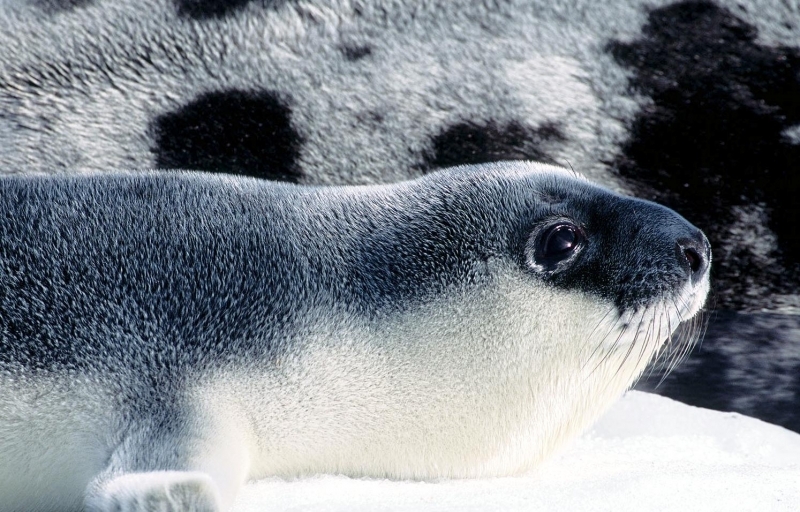 When the Hooded Seal pup is weaned, the male & female mate in the water. 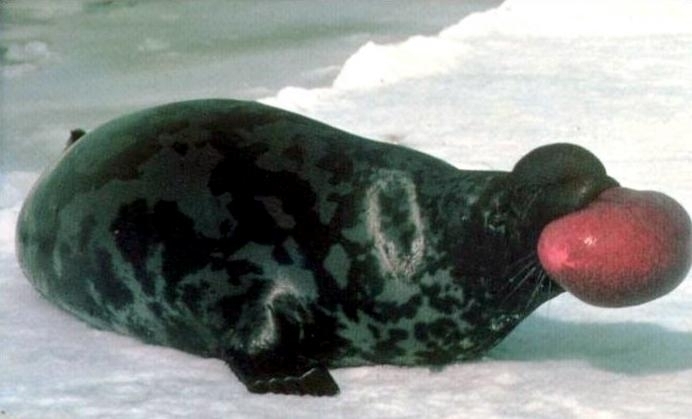 Several hours after mating, the male returns to the breeding territory in search of another female.